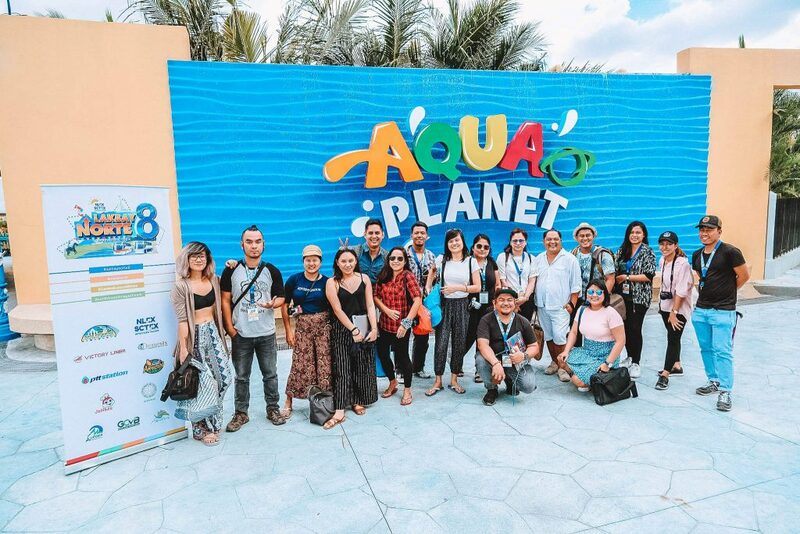 We first got to visit Aqua Planet Mabalacat Pampanga back when it was still about to open around February last year( read more things to do in Clark Pampanga) , but this time around it was luckily included in our Lakbay Norte itinerary – we were able to fully experience the rides and activities in the water park. 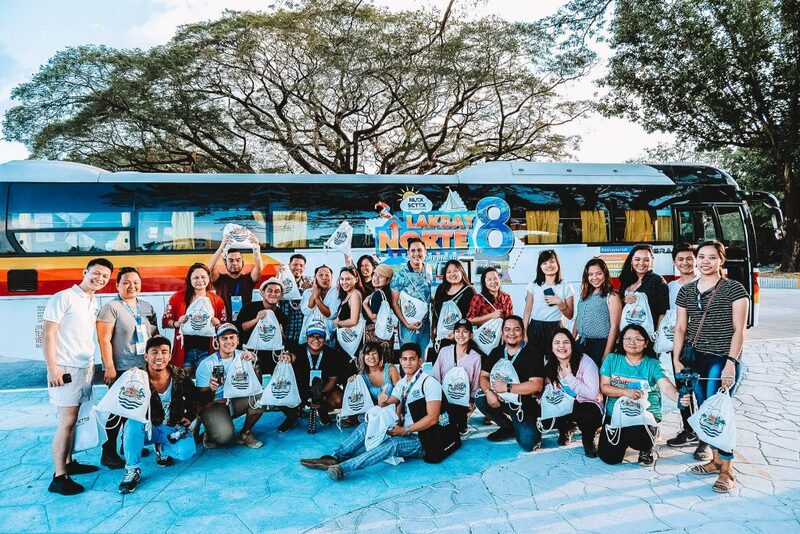 With its large 10-hectare grounds and short 3-hour drive away from the capital city of Manila, this modern water theme park in the Clark Freeport Zone is sure to be an exciting destination for couples, and groups of friends and family alike. 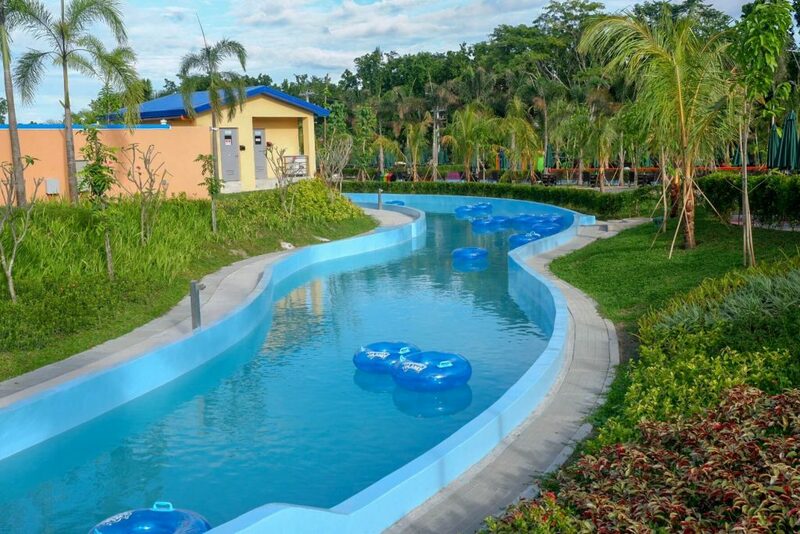 Aqua Planet Clark opens from 9:00 AM to 5:00 PM daily. 1 What are the attractions in Aqua Planet? 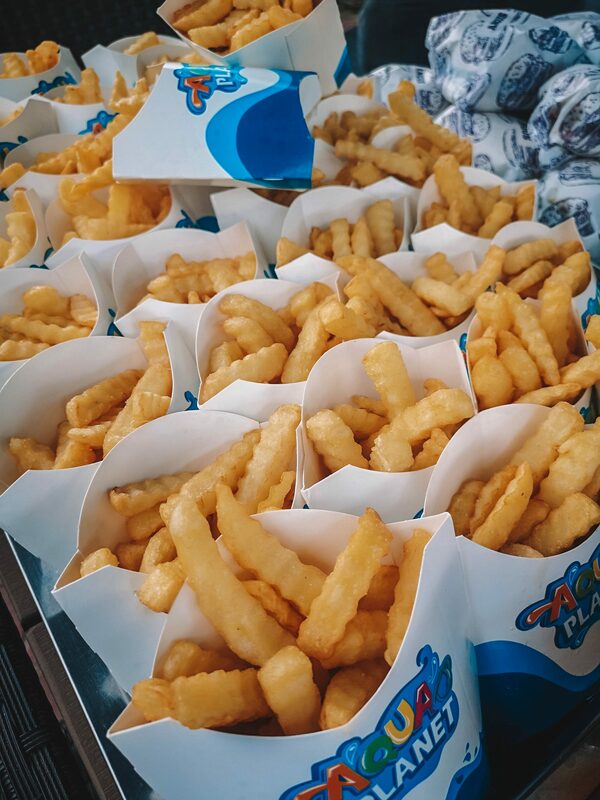 What are the attractions in Aqua Planet? 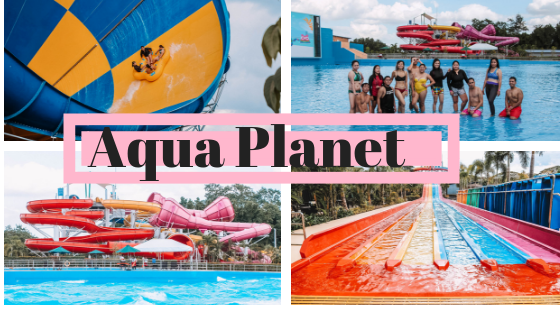 There are so many rides and attraction in the water park it’s hard to choose just a few – so here is a little Aqua Planet Review of their rides from some of my most favorite to the simplest ones – note that the simple ones are still very fun! The tornado is a really intense ride – arguably the most intense in the entire park! 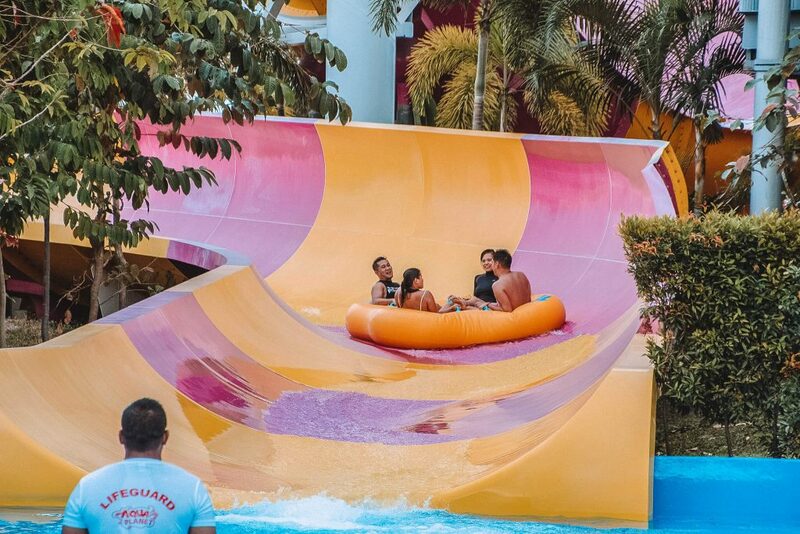 It’s a long slide filled with twists and turns that make you feel as if you’re in a tornado and then when you’re done slipping down the slide, it shocks you with a sudden drop into the pool. I loved this the most out of all the others. 4 people can ride on the tornado at a time, so you must be a group of 4 persons in order to do a round. If you’re less than that, then you better hope another group comes around to join you – if not then you’ll have to wait. If you’re 3 pax then one of the staff can accompany you if there are any available. I’ve tried this sort of attraction in another park before! It’s a bit intense, with sudden drops that make your heart feel like it’s stopped for a moment. You enter a capsule, the floor suddenly opens up and you just drop! It’s quite fun. I get paranoid being in a capsule personally, but for the adventure lovers and seekers – I feel like they would love this. 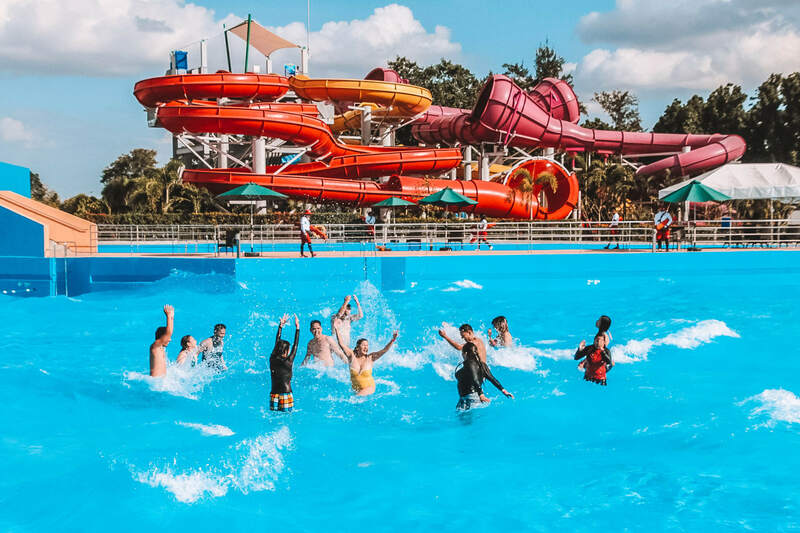 Note: Males you need to be shirtless, and for females you need to be in proper swimwear – no rash guards or anything to make sure you’ll be able to rise the whole ride – but don’t worry if you aren’t able to because there’s a rescue hole in the pool just in case. Here you can ride the waves without needing to go to the beach! 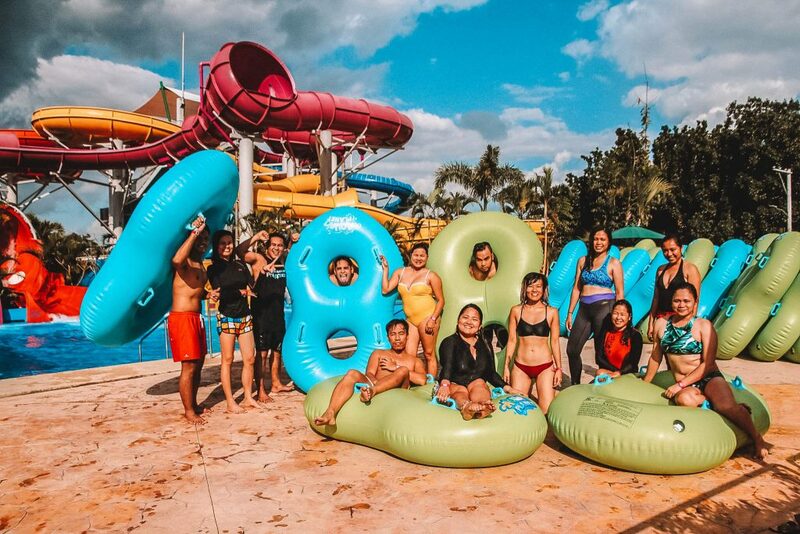 This attraction features a continuous flowing sheet of water which is pumped with waves both low and high while riders hold tightly onto their body boards and do their best to control the waves and stay balanced despite the tricky rolls and drops of the water. 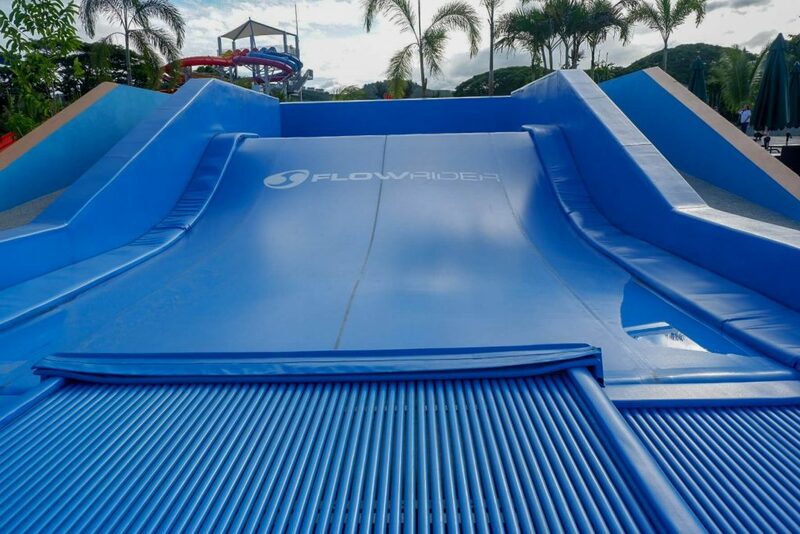 You need to sign a waiver to ride on the Flow Rider, but it’s also super fun especially for those looking for an adrenaline rush. Octopus Racers is best ridden if you’re in a group of 6! But the minimum number of riders is just one person, so you can slide alone. 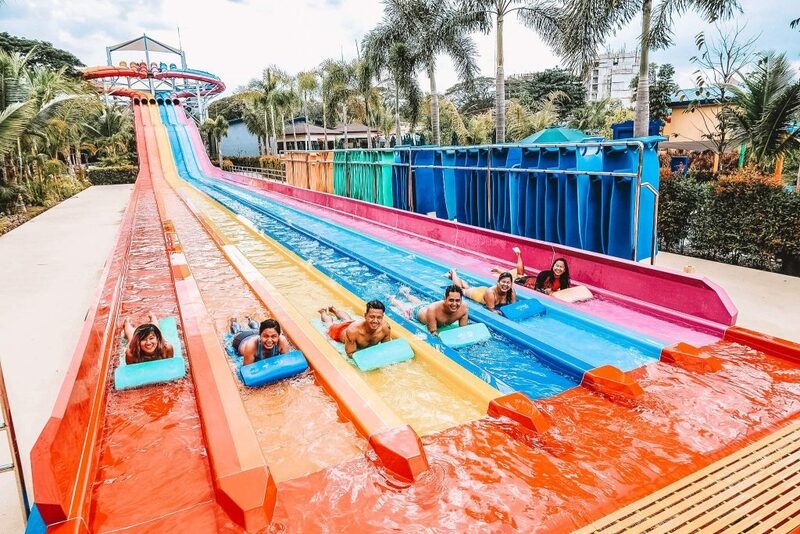 There are 6, rainbow colored slides placed side by side perfect for racing with friends. The slide starts off with a circular curve then declines back down onto the slippery ground. This is one of the prettiest attractions at the park, great for taking a pre-race Instagram photo. A series of swirling slides that make you feel as if you’ve been transported into a hurricane! There are four different slides here, the all requiring four riders at a time so make sure to bring along your friends and family for some of the most extreme twists, turns, and bends you can find at a water park – you can ride on either the slow or fast course rides depending on whether or not you want a chill ride down, or a little more excitement. 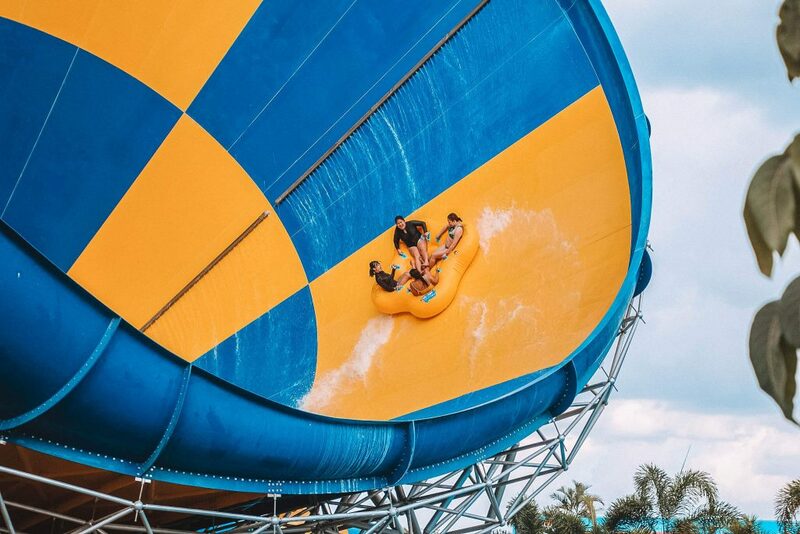 A super fun ride where your floater is blasted up high onto the steep wall by a very strong water jet and then you come sliding back down quickly into the waters so be sure to hold on to the grips tightly so you don’t fall off – this one also requires 4 riders at a time. 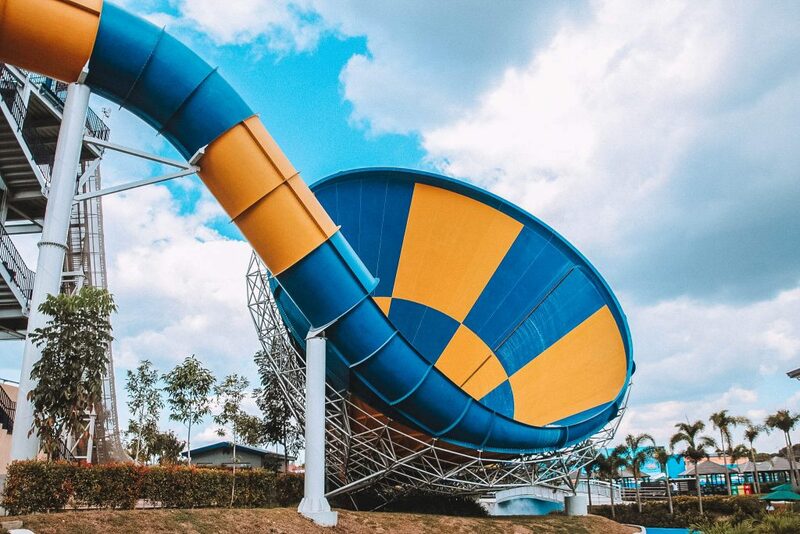 A swirling slide shaped like a bowl where you and three other friends can ride on a four-person raft and spin in circles until you’re eventually “flushed” down the tubes into a grand splash back into the main pool. A fun yet much more relaxing option compared to some of the park’s most extreme rides. A huge 3500 square meter pool situated in front of a giant TV – where events and shows are typically held at the water park. Stand in the wave pool and every so often, small and medium-sized waves get pumped into the water, making you bob up and down like an inflatable raft. 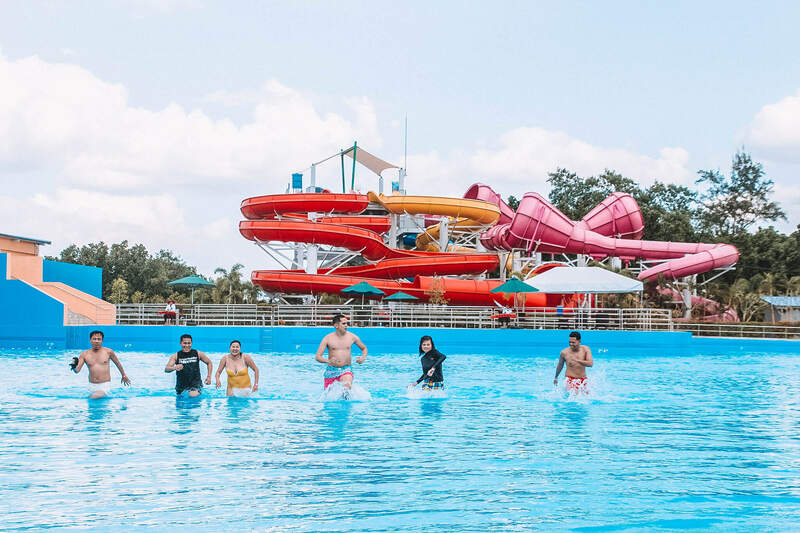 We ended up just bonding and dancing here – the wave pool is a great way to start to simmer down an exciting and fun filled day. A milder version of the Hurricane attraction. 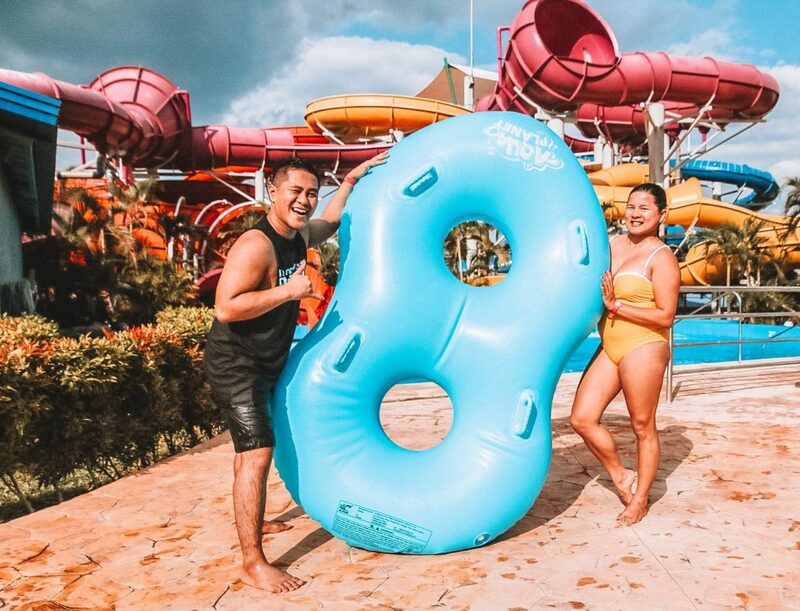 The spiral slides are great for younger or more subdued visitors who want to slide in the loops without the heart-stopping adrenaline rush – just sit back and relax as the water takes you through the twisted tubes of the slide. 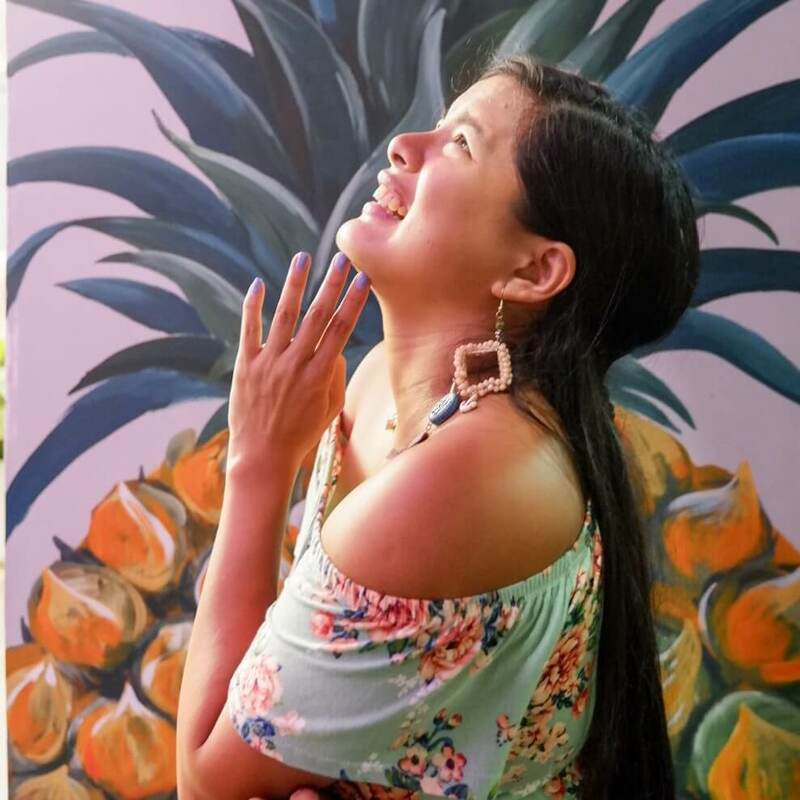 Of course, the part where you can all relax and just sit down and talk with your family and friends – one of the best attractions for a rest after eating, or to finally end the day. 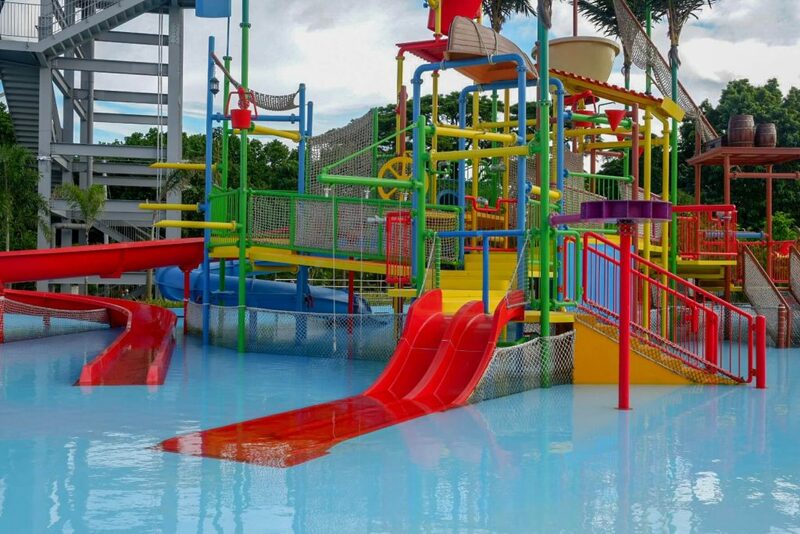 For those with kids there is a more shallow Children’s Play area as well, where they can entertain themselves with the smaller slides and inflatables. If you want some time to rest, don’t worry as there are many resting places like chairs with covered umbrellas scattered around the water park. The bigger cabanas which are good for large groups of 15-25 pax are paid for, however, with prices ranging from 3000-5000 PHP. 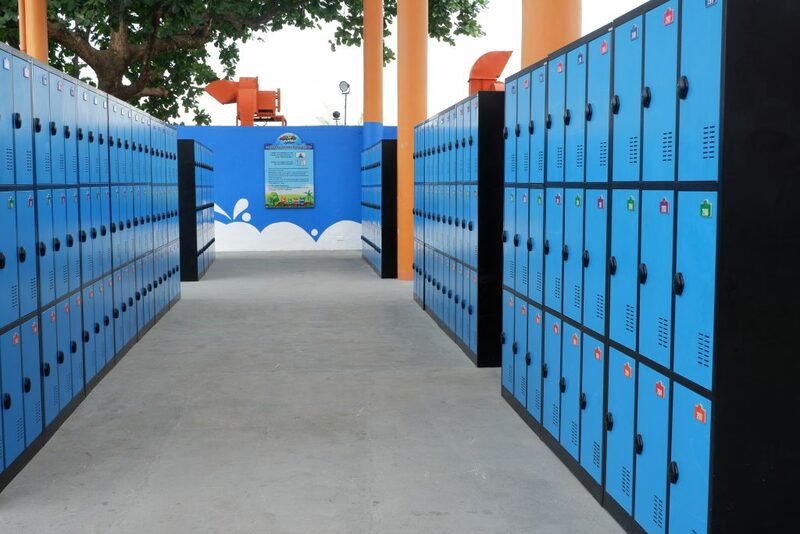 Lockers to hold your things safely while you’re out swimming are also available. One locker costs 150 PHP and is good for holding 2-3 medium sized backpacks, or one carry-on suitcase. The prices are cheaper if you’re less than 4ft but take note that they are not allowed to ride the more extreme attractions and pools. 1. There are no towels and toiletries available for use in the water park so make sure to bring your own. 2. Be in proper swim wear. Be sure to wear rash guards for the most intense rides like Flow Rider as well because the current is strong. 3. You need to return the tag after – be careful because you are responsible for it. 4. 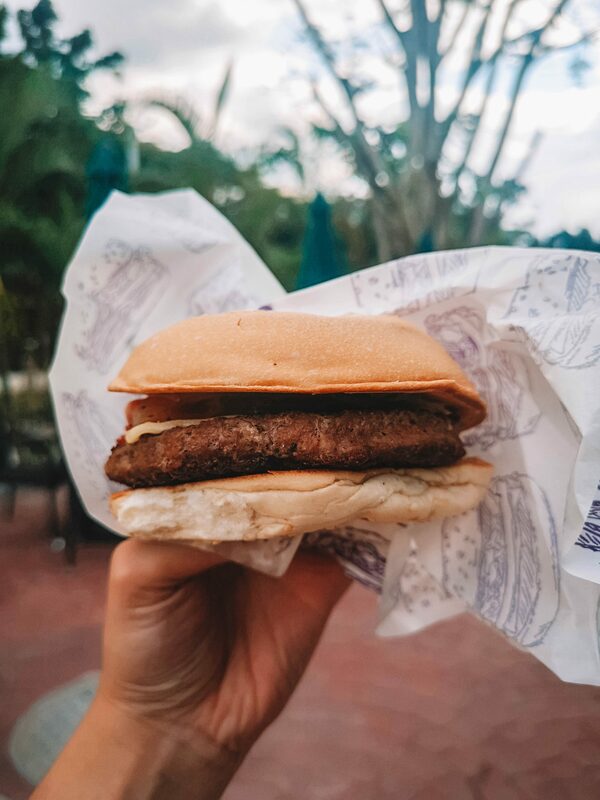 If you weren’t able to pack any food before heading to the park, don’t worry! They have food stalls and restaurants inside where you can purchase meals and beverages.